Kiteboarding is an action sport combining aspects of wakeboarding, snowboarding, windsurfing, surfing, paragliding, skateboarding and sailing into one extreme sport. 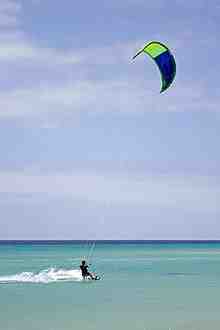 A kiteboarder harnesses the power of the wind with a large controllable power kite to be propelled across the water, land, or snow. Compared to the other sailing sports, kiteboarding is both among the less expensive (including equipment) and the more convenient. It is also unique in that it harvests the wind energy from a much larger atmosphere volume, comparing to sail size. 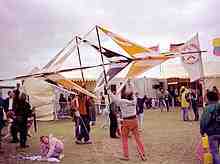 In 1990, practical kite buggying was pioneered by Peter Lynn at Argyle Park in Ashburton, New Zealand. Lynn coupled a three-wheeled buggy with a forerunner of the modern parafoil kite. Kite buggying proved to be popular worldwide, with over 14,000 buggies sold up to 1999. The development of modern-day kitesurfing by the Roeselers in the United States and the Legaignoux in France carried on in parallel to buggying. 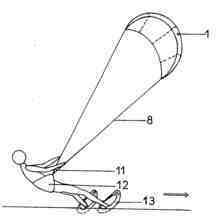 Bill Roeseler, a Boeing aerodynamicist, and his son Cory Roeseler patented the "KiteSki" system which consisted of water skis powered by a two line delta style kite controlled via a bar mounted combined winch/brake. The KiteSki was commercially available in 1994. The kite had a rudimentary water launch capability and could go upwind. In 1995, Cory Roeseler visited Peter Lynn at New Zealand's Lake Clearwater in the Ashburton Alpine Lakes area, demonstrating speed, balance and upwind angle on his 'ski'. In the late 1990s, Cory's ski evolved to a single board similar to a surfboard. In 1996, Laird Hamilton and Manu Bertin were instrumental in demonstrating and popularising kitesurfing off the Hawaiian coast of Maui while in Florida Raphaël Baruch changed the name of the sport from flysurfing to kitesurfing by starting and promoting the first commercial brand of the industry "Kitesurf". In 1997, specialized kite boards were developed by Raphaël Salles and Laurent Ness. By the end of 1998 kitesurfing had become an extreme sport, distributed and taught through a handful group of shops and schools worldwide. The first competition was held on Maui in September 1998 and won by Flash Austin. Starting in 1999, kitesurfing became a mainstream sport with the entry of key windsurfing manufacturers namely Robby Naish and Neil Pryde. Single direction boards derived from windsurfing and surfing designs became the dominant form of kiteboard. In 2000, a new freestyle competition, sponsored by Red Bull was launched in Maui. The competition, named Red Bull King of the Air, judged riders on height, versatility, and style. The competition is still held annually in Cape Town, South Africa. From 2001 onwards, twin-tip bi-directional boards became more popular for most flat water riders, with directional boards still in use for surf conditions. In May 2012, the course racing style of kitesurfing was announced as a sport for the 2016 Rio Olympics, replacing windsurfing. However, after a vote by the General Assembly of ISAF in November 2012 (in Dun Laoghaire, Ireland) the RSX windsurfer was reinstated for both Men and Women this was an unprecedented decision when the constituent members of ISAF overthrew a decision made by the ISAF Council Kitesurfing remains therefore a non-Olympic sport until 2020 at the earliest. The ISAF mid-year meeting of May 2013 proposed seeking an eleventh medal to include kitesurfing in 2020 at the same time there was a commitment made to retain the existing other 10 classes as they are for 2020 and even 2024 including the RSX windsurfer for men and women. Kitesurfing was named as an official event at the 2018 Summer Youth Olympics in Buenos Aires. Nick Jacobsen achieved the world record for the highest kite jump measured by WOO Sports on February 19, 2017 in Cape Town, South Africa, during a session with 40-knot winds. Jacobsen's jump reached 28.6 meters high, with an airtime of 8.5 seconds. Jesse Richman holds the record for hangtime at 22 seconds, set at Crissy Field in San Francisco, California. Airton Cozzolino holds the record for strapless hangtime at 19 seconds. French kitesurfer fr:Sébastien Cattelan became the first sailor to break the 50 knots barrier by reaching 50.26 knots on 3 October 2008 at the Lüderitz Speed Challenge in Namibia. On 4 October, fr:Alex Caizergues (also of France) broke this record with a 50.57 knots run. Similar speeds are reached by windsurfers in the same location by Anders Bringdal and Antoine Albeau, respectively 50.46 and 50.59 knots. These speeds are verified, but are still subject to ratification by the World Sailing Speed Record Council. Earlier in the event, on 19 September, American Rob Douglas reached 49.84 knots (92.30 km/h), becoming the first kitesurfer to establish an outright world record in speed sailing. Previously the record was held only by sailboats or windsurfers. Douglas also became the world's third over-50 knots sailor, when on 8 September he made a 50.54 knots (93.60 km/h) run. On 14 November 2009, Alex Caizergues completed another run of 50.98 knots in Namibia. October 2010, Rob Douglas became the outright record holder for the short distance 500 meters with 55.65 knots. Sébastien Cattelan became the record holder of France and Europe with 55.49 and was the first rider to reach 55 knots. On 13 November 2017, French rider fr:Alex Caizergues became the new world speed record holder in France (Salin de Giraud) reaching 57.97 knots or 107.36 km/h. Louis Tapper completed the longest recorded kite journey, completing 2000 km between Salvador and Sao Luis, Brazil. The journey was completed between July/August 2010 and took over 24 days of kitesurfing. This trip is also the longest solo journey, completed without support crew, using one kite and a 35-litre backpack . The previous longest recorded kite journey was by Eric Gramond who completed a 13-day trip of 1450 km along the coast of Brazil. Constantin Bisanz, a 41-year-old Austrian, crossed a 50-mile stretch of the Bering Strait embarking from Wales, Alaska on August 12, 2011 at 4:00 am, and arriving in eastern most Russia two hours later, after which he returned by boat to Alaska. It occurred after 2 previously failed attempts, the first of which was on July 28, 2011, in which an incident occurred where he found himself floating in 36 °F water with no board, kite or GPS unit for 1 hour before being rescued. On his second attempt on August 2, he and two friends sailed half the distance before turning around due to poor wind conditions. A team of six kitesurfers, Filippo van Hellenberg Hubar, Eric Pequeno, Max Blom, Camilla Ringvold, Ike Frans, and Dennis Gijsbers crossed the Atlantic ocean, from the Canary islands to the Turks and Caicos Islands a distance of about 3,500 miles (5,600 km), from 20 November 2013, to 17 December 2013. Each of the six spent four hours each day surfing, broken into two sessions of two hours each, one during the day, and the other during the night. On water, a kiteboard, similar to a wakeboard or a small surfboard, with or without footstraps or bindings, is used. Kitesurfing is a style of kiteboarding specific to wave riding, which uses standard surfboards or boards shaped specifically for the purpose. On land kiteboarding, a board shorter and lighter than mountain board or a foot steered buggy[disambiguation needed] are used, including for sand (sandkiteboarding). It is a great cross-training for kitesurfing. Skis or snowboards are used in snow kiteboarding. In 2012, the number of kitesurfers was estimated by the ISAF and IKA at 1.5 million persons worldwide (pending review). The global market for kite gear sales was then worth US $250 million. The Global Kitesports Association (GKA) estimates 10% of the kitesurfers continue during winter. After substantial growth, activity was levelling by 2017 at around 85.000 kites sold yearly by GKA members, twintip boards sales decreased from 37.000 in 2013 to 28.000 in 2016 and directional boards from 8.000 to 7.000. The largest manufacturers are Boards and More (previously under the North brand, now Duotone) then Cabrinha (Neil Pryde) with 25-35,000 kites a year each. They are followed by Naish, F-One, Core kiteboarding, Slingshot sports, Liquid Force, Airush, Ozone Kites, Flysurfer then the others. The GKA recorded 100,000 kites sales in 2017 for its members, giving an estimated 140-150,000 total kites sales for 2017. Technavio predicts a global kiteboarding equipment market reaching US$2,120 million by 2021, growing at a CAGR of almost 9% from 2017.